i met sean in the chaos of the Lima airport. it was great to see him again and i felt speechless with happiness. we flew to Cuzco early the next morning. Cuzco is brilliant. 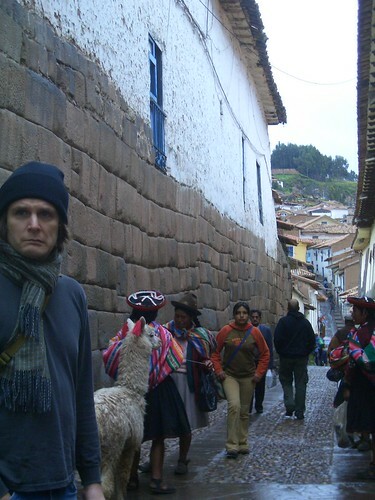 we stayed mostly in the old part of town, hiking up and down narrow cobbled streets between ancient Inca stone walls. just getting to our hostel was exhausting at that high altitude. we really needed the first three days to acclimate. we bought a pass to visit the cathedrals around the main plaza. the tours were dense with information and amazing art to interpret. no photos allowed i am afraid. somewhere we read that Cuzco is a mix of pagan past, catholic solemnity, and latin fiesta. i think that is a good start to an explanation. sean was a walking target for shoe shiners. i was a target for the girls trying to sell spa packages. and there was always a little, wrinkly, toothless lady with a llama around if we stopped anywhere for too long. we woke at 5:30 on the 4th day to meet our guide for the Inca Trail. the first day was the hardest. we both were depleted from some mysterious sickness. i was so worn down i couldn’t even bother to step around the donkey poo in the path. we really didn’t know if we were going to be able to continue. the first day is supposed the be the easiest! at camp the first night we were able to hire a porter to carry our personal bags, and after a solid nights sleep we were able to continue. 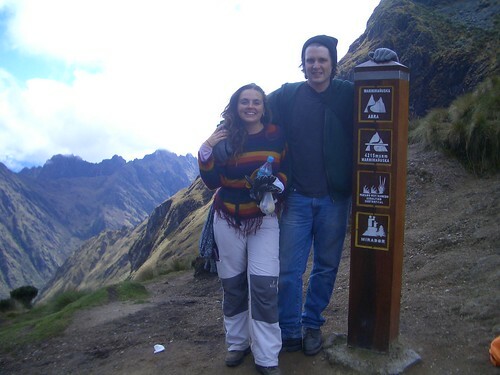 the Inca Trail was like something from someone’s imagination. like a giant movie set for Indian Jones. my photos try to represent the range of it… but it is impossible to capture the magnitude. i had never aspired to climb a mountain but hiking over the high pass on the second day was breathtaking. it felt awesome. we had an amazing mountain campsite where we watched the clouds roll over and into the valley. someone finally showed me the constellation of the southern cross. that night i dreamt an incan man told me i was out of clean socks. hm. our guide said the land was an old burial site. hm. Hey, I’m glad to hear you are both feeling better from what ever you had! That had to make you feel a little uneasy. Everything you have done and seen there has been taken right from our imaginations and wonders. It really is awesome. Enjoy the rest of your time,maybe sit back RELAX and reflect on the whole time and we will see you soon. RIGHT? We all wish safe travels to you and Sean, Erica. Miss and love ya. very cool! We’re having bookclub tonight and looking forward for you to join us in June sometime right?